All Fedex locations have been swamped today (particularly in the afternoon) and it took anywhere between 2-3 hours to drop off any thing at most Fedex locations. All firms (both Consulting firms and big firms alike) looks to be sending their H1B visa petitions today by Fedex to reach USCIS offices before they are opened on monday, 2nd of April, 2007. Keeping in mind the last year's rush (50% of the quota limits were reached with in a span of 10 days), this time nobody want to miss this year quota. Rumours are all around speculating that number of applications received on day 1 itself will reach the quota limits and USCIS might go for lottery to pickup applications. One might think that Outsourcing and moving of development centers to offshores might reduce job opportunities in US. But the demand for H1Bs has been steadily growing. If number of applications received by USCIS is any indication to that demand, one will be surprised for sure this year. Its very interesting to note that many consulting firms hire nobody but H1Bs these days. No wonder, there is a mad rush for H1B visas by every body. 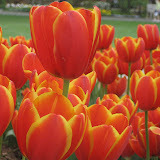 A short Video with pictures from weekend visit to Dallas Arboretum for wonderful Dallas Blooms. If you haven't visited yet, hurry up. I thought I should have visited a week earlier. Original Pictures here: Dallas Blooms Photo Album. Just in time for Cricket World Cup 2007, found a Google desktop widget that shows live cricket scores. Thanks to Google. Its quite a surprise this time that none of India and Pakistan reached super 8s. I haven't watched Pakistan games, but watched all India games. And I felt that India didn't play a good game and well deserve the role of spectators for the rest of the tournament. At the end of Bangladesh match, I declared that India is out of the worldcup, not that I knew they will loose against Srilanka, but I failed to notice any 'hunger' in Indian cricket team to fight and win the cup. Its an unfortunate and sad page in the annals of Indian cricket. If there is something that I can take from it, it doesn't matter how good you are and how skillful you are, the application matters the most. There is a classic gameplan of cricket, playing the best of shots and mind-blowing deliveries and then there is a gameplan that can win games. Wonderful and lovely cricket is still ahead with first of Super Eights coming up on tuesday, between WI and AUS. All cricket lovers will certainly enjoy a a fighting game and so does will love the worldcup that brings the best of each team. My favorites for the cup, AUS again. Wish you All A Wonderful New Year. This new Year, I wish your dearest dreams will come true. Enjoy all the tastes of life in one and only one Ugadi Pachadi. Dream Crashers All Around? Are you ready? Not many people comeup with Ideas and Opinions on any given subject on their own. But when some one express an opinion or share an Idea, the whole world wakesup. Some try to tear the opinion or idea apart by giving their 'expertise' judgement. Some express 100s of reasons why it will fail. Some question the motivation behind the idea or opinion. Some shoots the messenger itself. A very few, believe me, you can count them on fingers, see the potential and will try to understand the implications. These days, we see 100s of them in blogs, articles, magazines, conferences, reviews, interviews, commentaries and every social gathering that try to offer and market their judgements, comments and suggestions. I guess, this is a natural tendency and human nature that is completely in line with Darwin's law of 'survival of the fittest'. Not everybody is humble to see through. And truly and honestly, not everybody is competent to see it. And there is nothing absolute about somebody always on one side of it. We all come under that 'many people' in one instance and we will be on the receiving side in another instance. If we you have a dream, a new idea about a product or service, you approach the same community for one or the other reason. And we are sure on the receiving side this time. There will be 100s people telling you what is wrong, what is right, what is the better way and why you must listen to them. This is something you can not avoid. But You could take advantage of it if you give it a thought and be prepared for it. The reason Your idea is brand new, because No one ever thought about it or precisely no one ever expressed it. Most probable reason could be that they don't see the potential or feasibility of the idea itself, since Many of us who are regular readers of blogs, frequent attendees to conferences and social gatherings have a sense of different market opportunities. And, Probably we are trying to 'convince' the same people about the idea. Your gut feelings say it. Your intuition says it. But it is almost impossible to prove it. Hugh MacLeod's manifesto on 'How to be Creative' says it with a pinch of salt. The more original your idea is, the less good advice other people will be able to give you. When I first started with the cartoon-onback-of-bizcard format, people thought I was nuts. Why wasnÊ¼t I trying to do something more easy for markets to digest, i.e., cutie-pie greeting cards or whatever? You donÊ¼t know if your idea is any good the moment itÊ¼s created. Neither does anyone else.The most you can hope for is a strong gut feeling that it is. And trusting your feelings is not as easy as the optimists say it is. ThereÊ¼s a reason why feelings scare us. And asking close friends never works quite as well as you hope, either. ItÊ¼s not that they deliberately want to be unhelpful. ItÊ¼s just they donÊ¼t know your world one millionth as well as you know your world, no matter how hard they try, no matter how hard you try to explain. It is not confined to a few individuals that we often fail to see. We all tend to argue if we take some real life examples that are happening at this moment. But have a look at some of the following well known stories, we all might see the point. How many Computers The World Need? I think there is a world market for about five computers" â€” Attributed to Thomas J. Watson (Chairman of the Board of International Business Machines), 1943. "What would I do? I'd shut it down and give the money back to the shareholders"
One of my favorite bloggers, Pamela Slim at Escape From Cubicle Nation shared another interesting aspect of becoming an Entrepreneur. The shift in your relationships, the moment you share your idea. One of the unexpected parts of heading towards your right life is discovering that sometimes those around you are not ready, willing or able to see you change. This can result in disagreements, fracturing or even ending long-term friendships and relationships. Relationships put a serious pressure on your motivation and commitment towards our goals and for some of us it might crash the dream itself. So be prepared and expect that every other person you come across will try to crash your dreams. Surround yourself with trusted friends and partners and people who honestly encourage you. Friction and Rejection is inevitable and quite needed to move forward. So are the dream crashers. You can't avoid them. Try to see if you can take advantage of the ideas and objections raised. You might well find a new opportunity to grow your business. Wish you all find an Inspiring band of partners and friends and Good Luck. One of my favorite bloggers, Pamela Slim at Escape From Cubicle Nation shared yet another interesting aspect of becoming an Entrepreneur. The shift in your relationships. Having experienced (ing) first hand how people around you react to your plans of becoming an entrepreneur, I would suggest that you read her post to get some great insights to get prepared. Based on my personal experience, if you are working somewhere currently, I suggest that you DO NOT share your plans with anybody. I deeply regret sharing this with my buddies at work. Word gets out pretty fast, and trust me, not many (infact most) will like it. I love Grady Booch, for how he defines Software Engineering and lives up to his own expectations and privileges of being a Software Developer. Here is an Interview with Grady Booch by Software Engineering Radio. If you haven't watched, you must watch the video presentation by Grady Booch: The Promise. The Limits and The Beauty of Software. In this Episode we are happy to talk to Grady Booch. We started off by discussing his Architecture Handbook, how it came into being, the progress, and how it will look like once it's finished. In this context we also looked at the issue of how to distinguish architecture from design. We then asked him about how "professional" software architecture is these days, as well as about the ubiquity of software product lines in industry. The next couple of minutes looked at the question of whether software development is an engineering discipline, craftsmanship or an art form, and we discussed the key qualifications of software developers. Grady then elaborated on the problems of developing in large teams as well as the potential limits of complexity we can tackle with software. We then got back to a more technical discussion, where we looked at model-driven development, DSLs, etc. and the role of the UML in that context. Next was a discussion about scripting languages, and the current trend towards new languages. We then looked at component marketplaces and other forms of reuse, as well as the importance of OO these days and the relevance of AO. We concluded with a (small) outlook to the future. Where the hell is my package? I would be glad and little suprised if you could decipher the following tracking information provided by USPS and tell me where is my package. I recently ordered an item at Amazon.com on 28th Feb, 2007. Though, the Amazon.com page said the item is available and will be shipped immediately, the item seems to have been shipped 5 days later on 5th of March through USPS. Amazon.com sent me a tracking number to track the shipment. I looked up the information with that tracking number at USPS, I am totally confused at the following tracking message. It says, the package was processed and left the Dallas TX 75398 facility on 7th March, 2007. I am expecting to receive the package in Dallas, TX itself. And when I looked up today, it still says the same message except that now it says 10th March, 2007. I don't have a clue where Amazon.com is shipping this particular product from. And I don't have a clue where it is currently either. I clicked on the 'Additional details' button and this is what I see. This doesn't make any sense. First of all it is confusing when it said it was processed in Dallas TX itself and was enroute to Dallas TX for almost 5 days. It would have been a lot better and atleast gave me a sense of information if the message atleast identifies where the product was originally received and processed and the last city that knows about this product than 'cryptic' and yet politically and technically correct message 'enroute Dallas Tx'. What Indians Are Really Searching For? These numbers are too low to draw any conclusions about what Indians are searching for or what the world is searching for in/about India. But it is very interesting to know the top search keywords around India. I am trying to understand what Indians are really searching for and what the world is trying to find out about India. Well, search is still on..! Whenever we think of collaboration and community built documentation, I believe there is no other form best suitable than wikis. Along with religious patronage by Open source communities and new web2.0 entrepreneurs, many Small businesses started adapting Wikis as an integral part of collaboration platforms. Applications like Jotspot (acquired by Google) makes it lot easier for anybody to get started. I heard that a few corporates are giving it a try too. I love the concept of Wikis and its underlying power of simple and yet powerful collaboration for any kind of enterprise small or big. Wikis are particularly important for virtual teams, where team members are physically distributed throughout the world and there is a need for a precise and lots of coordination required. But it looks like its a long way to go before wikis are accepted. Still many corporate managers are very reluctant to accept wiki, some even to give it a try. After a few hours of discussions and attempts to explain why wiki is a much better form of collaboration for the given situation, I gave up as we reached a certain point where 'reasoning' or logic stopped making any sense. The "authority" replaced the "logic" instead. Knowing what Wikis can do and knowing political reasons for how a Corporate chooses its tools, I can't hope to see wikis in mainstream corporates any sooner than expected.